This refreshing Citrus Fennel Avocado Salad with a fruity champagne vinaigrette is like sunshine on a plate! Happy first day of Spring! It’s been a loooong, cold winter (as usual in Michigan), and it’s finally starting to feel like spring around here! Last year we had a few warm days in February before it went back to winter until late April, so we’re ahead of schedule this year! The last few days, we’ve been able to take a break to walk the dogs (in the sunshine!!). It’s made all the difference in our productivity and motivation. Working is so much more enjoyable when we can crack open a window for some fresh air. We’re just savoring the weather for now, because it’s still Michigan and could snow tomorrow (or in like, 2 hours). As much as we’re looking forward to spring and summer produce, citrus season is still in full force and we love all the vitamin C. Citrus salads are a favorite in the winter, especially with all the comfort food (which we’ve been sharing a lot of lately…hello Mushroom Stew and Lentil Shepherd’s Pie! ), so we are more than ready for this citrus fennel salad. 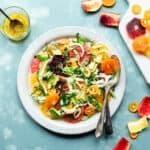 We always have a plethora of various citrus laying around the house from December to March, so we add a bit of everything to this citrus salad. 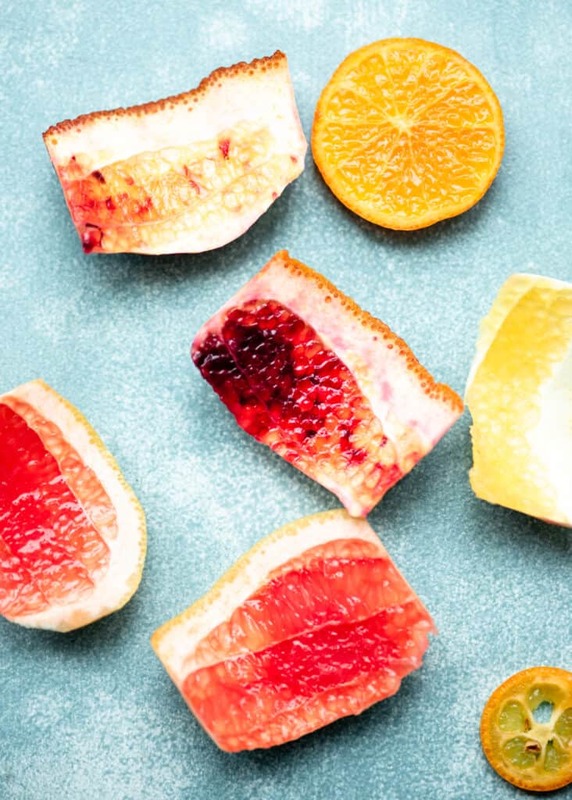 Here, we used grapefruit, blood orange, navel orange, mandarins and a few kumquats (read more about them here)! A little bitter, a little sweet, a little tart – the perfect balance. We love pairing refreshing citrus with a crunchy vegetable (here, fennel) and creamy avocado for balanced texture. Admittedly, I (Lexi) am not a big fan of fennel, but my mom loves it. She may just have changed my opinion with this citrus fennel avocado salad. Since fennel has such a strong flavor, the key is to marinate it in the dressing ahead of time. The citrus dressing is sweet, tangy and bright thanks to fresh juice + champagne vinegar. It really tames the fennel to a level that even I can handle. Fresh mint and fennel fronds make for a beautiful, herbaceous garnish. This citrus fennel avocado salad makes for a great appetizer with a crisp glass of dry white wine. We also love it on the side with pesto pasta, or if you’re not vegan/vegetarian, fish or chicken. For a slightly heartier citrus salad, try this Roasted Beet, Citrus and Lentil Salad! This refreshing Citrus Fennel Avocado Salad with a citrus champagne vinaigrette is like sunshine on a plate! To make dressing, whisk all ingredients together to emulsify. Alternatively, add all ingredients to a glass jar, seal with lid and shake well. Slice fennel thinly and marinate in bowl of dressing for about 30 minutes. Prepare citrus and avocado, then plate with fennel and drizzle remaining dressing over top. Garnish with fresh mint and fennel fronds. Enjoy! To prepare fennel, trim the stalks, slice bulb in half lengthwise, and slice crosswise. The fronds (the tiny leaves that look like dill) are totally edible and can be included in the salad.